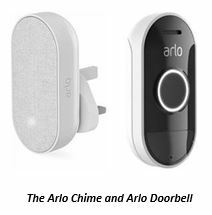 Arlo Technologies has announced the Singaporean availability and pricing of its all-new Arlo Audio Doorbell and Arlo Chime. Designed with flexibility and DIY simplicity in mind, the Arlo Audio Doorbell and Arlo Chime pair with Arlo wire-free cameras or Arlo smart lights for a more complete view of the entryway, or serve as a standalone smart audio doorbell solution. Through the free Arlo app, users can access their Arlo Audio Doorbell to interact with visitors from their smartphone or tablet. If paired with an Arlo wire-free camera, users can also use an Arlo Smart subscription service plan to intelligently detect people, saving valuable time. The smart audio doorbell solution is available across Singapore at Challenger outlets and Harvey Norman with a suggested retail price of SG$129.00 for the Arlo Audio Doorbell and SG$98.00 for the Arlo Chime. “The Arlo Audio Doorbell and Chime build on the success of our existing Arlo wire-free cameras by allowing users to easily engage with entryway visitors from anywhere. With its friendly price tag, the smart audio doorbell solution acts as a sensible first step towards creating a rounded home security ecosystem,” said Vice President and Managing Director, Arlo Technologies, APAC, Brad Little. “With the release of the Arlo Audio Doorbell and Chime, Arlo leverages on its existing home security solutions to give users the option of expanded functions and greater peace of mind. Moving forward, Arlo aims to become a provider of comprehensive, end-to-end home security solutions and this release serves as a step towards that direction,” added Little. The Arlo Audio Doorbell is easy to install, replaces traditional push-button doorbells and calls the user’s smartphone when the doorbell is pressed. Residents can then speak with, or if an Arlo wire-free camera is paired with the Arlo Audio Doorbell, even see their guests directly from their smart device. Users can communicate live with visitors through their mobile phone, or tap to reply with a pre-recorded message when in a situation where it’s not convenient to talk. The all-new Arlo Chime accessory complements the Arlo Audio Doorbell to complete the smart entry experience. By plugging into any standard power outlet, Arlo Chime works in tandem with the Arlo Audio Doorbell and Arlo wire-free cameras to transmit instant alerts to any room where plugged in, even if users are not near their phones. With volume control and options for melodies that can be adjusted via the free Arlo app, Arlo Chime can produce an audible alert loud enough to serve as an 80+ decibel siren. Silent Mode can also be activated to disable alerts and disruptions – perfect for families with napping children or times when silence is golden. The Arlo Audio Doorbell, Arlo Chime, Arlo cameras and security lights are all easily managed through the Arlo app, available as a free download from the Apple App Store® or Google Play ™ Store. In addition, Arlo users can add on Arlo Smart – the recently launched subscription services plan that utilises intelligent algorithms and advanced analytics to deliver more personalised, meaningful notifications and added peace of mind. Arlo Smart is available for purchase for every Arlo camera either through the Arlo web portal or Arlo app. Arlo Smart service plans also extend the availability of cloud recordings up to 60 days and start at just SG$3.99 per camera per month, or SG$11.99 per per month for the Premier subscription for up to 10 cameras. Annual subscriptions are also available for the Premier plan at SG$119.00 and the Elite plan at SG$199.00. Arlo is also offering new subscribers a one-month free trial of the Arlo Smart Premier plan. While existing Arlo wire-free camera users can purchase the Doorbell and Chime as standalone solutions to supplement their home security ecosystem. Please visit arlo.com/asia for more information on the full range of Arlo Smart Home products and services. Arlo is the award-winning, industry leader that is transforming the way people experience the connected lifestyle. Arlo’s deep expertise in product design, wireless connectivity, cloud infrastructure and cutting-edge AI capabilities focuses on delivering a seamless, smart home experience for Arlo users that is easy to setup and interact with every day. The company’s cloud-based platform provides users with visibility, insight and a powerful means to help protect and connect in real-time with the people and things that matter most, from any location with a Wi-Fi or a cellular connection. To date, Arlo has launched several categories of award-winning smart connected devices, including wire-free smart Wi-Fi and LTE-enabled cameras, advanced baby monitors and smart security lights. ¹ Battery life may vary dependent upon certain conditions such as WiFi range, connectivity and frequency of usage. ² Visit arlo.com/asia/support/ to see a list of compatible digital and mechanical chimes.